Paw Print Genetics - Are You Ready for a Puppy? The kids might be whining for a puppy, and you might actually be considering bringing one into your home. But are you actually ready for a puppy? You can tell your spouse, co-workers, friends, the kids and even yourself, that the new puppy belongs to the kids and they are responsible for it. But that’s a lie. This is your puppy, and soon-to-be adult dog. Don’t try to fool everyone else or yourself. After about two weeks, the kids’ attention will shift to something else – school, sports, cartoons, sitting on the couch. If the kids have soccer practice, homework, slumber parties or whatever else, the feeding, exercising, potty-break and clean-up responsibilities fall to you – more than likely that will happen even if they don’t have something going on. Even if your kids do consistently take responsibility for the dog, you’re probably going to have to remind them to do it. In essence, you’re taking on another child for the next 10 to 15 years. Are you ready for that? Before you bring a puppy into the home, you’ll need a few basics: food and water bowls, a crate and blanket/sleeping pad, chew toys and a leash. Oh, and plenty of plastics bags and a perhaps a shovel – those are for you to clean up after your new addition (unlike with children, bathroom duty never ends with a dog). Depending upon your home and personal desires, you can add door gates to restrict access to rooms in the house. If your puppy/dog will spend a significant portion of time outside, tack on a dog house, secure kennel and/or a tie-out that’s long enough to allow the dog freedom of movement – the ability to find shade or rest in several areas and to do so without laying in his own feces or urine. It should be secured to something immovable – a large tree or other object sufficiently anchored into the ground. If your dog will be trained for hunting or another endeavor, such as agility, you’ll eventually need equipment related to that: bumpers, scents, blank pistols, dummy launchers, weave poles, ramps and loads of other stuff. Is your home suitable for a puppy, and for the adult dog it will become? Is your living situation stable? Picking a puppy simply because it’s cute, without considering the breed’s requirements, is a surefire descent into unhappiness for you and the dog. Cooping up an active or large-breed dog in a small apartment will end badly for both of you – usually the dog gets the worst of it. 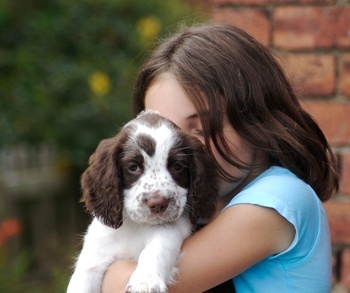 Know what you’re buying and pick a puppy from breed that fits your lifestyle. Additionally, consider the stability of your living situation. Do you own or are you renting? Are you prepared, perhaps in the future, to find a rental property or homeowners’ association that accepts your breed – even if it costs more or you have to pass on a place that’s perfect otherwise? Understand that many apartments, rental houses and homeowners’ associations have breed and size restrictions, and that pet deposits and non-refundable fees are usually standard. Be a responsible dog owner and plan ahead; think of what you’re willing to do should circumstances change. Puppies take time – time to housebreak, time to train good citizen behaviors, time to exercise daily. Dogs only learn through consistent repetition, so not only do you have to dedicate time to training, you have to be sure to repeat the training exactly the same way each session – and you have to make sure that you’re keeping that training exciting, interesting and rewarding to the dog. Further, you have to make sure that you’re not untraining those behaviors throughout the rest of the day –allowing the dog on furniture for 10 hours a day will override even the most positive of 10-minute training sessions. A dog is not a hermit crab. You can’t drop a little food in its bowl and skip town for a long weekend. A dog requires fresh, clean water daily, along with food. It needs shelter from heat, cold and other weather. It needs exercise and interaction. Some dogs require daily medication. If you leave town for business or pleasure, for a weekend or a more than a week, you must plan for your dog’s care. That could be a friend or family member coming over to play with, feed and clean up after your pup, or it could that person staying with or inviting the dog into their home. The other option is boarding your pup with a kennel, which will cost a minimum of $10 to $15 per day – more if the dog requires medications or you want extra exercise time, grooming, etc. Of course, you can always bring the dog with you, but plan on stopping every two-to-four hours to give the dog water, exercise and a bathroom break. You’ll also have to consider lodging and whether your hotel(s) accept dogs, and be willing to pay that fee. Stopping at restaurants and roadside attractions is another concern – you can’t leave a dog in hot car during summer months. Before bringing that dog home, consider how much you and your family travel, and if you have contingency plans for the dog. Lastly, you have to be realistic about how much a dog costs, and if you can afford that price tag for the next 10 to 15 years. The upfront costs – the purchase price and one-time investments (crate, food bowl, leash, etc.) – are the smallest financial costs associated with buying a dog. At a minimum, you’re likely to spend $1,000 or more per year on food, routine veterinarian bills, boarding, grooming, toys and all the other costs that come with dog ownership. The AKC estimates those yearly costs much higher – $2,500, based on surveys of their members. That’s a lot of dough. Are you financially willing, ready and able to take on that responsibility for more than a decade? While the kids might say that they want (or even need) a dog, and while you might actually want one too, you have to pause for a moment and consider if you’re in the right place – both physically and financially – and time in your life to responsibly provide for that dog.